The concepts of potential output and output gap (i.e. 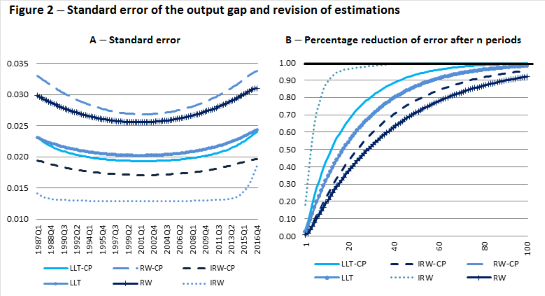 the percentage deviation of actual output from potential output) addressed in this Working Paper (in Italian) have in recent years taken on considerable importance within the framework of EU rules. The definition of these variables determines the assessment of the cyclical position of the economy and the implications for consolidating the public finances. Nevertheless, the estimation of these variables is characterised by considerable uncertainty, with their values differing significantly depending on the approach adopted. For example, that used by the European Commission, which was agreed with the Member States, provides measures of potential output and the output gap (OG) that have diverged substantially, especially in recent years, from those produced by other international organisations (OECD and IMF). The recent economic crisis appears to have made the determination of these variables even more complex. The long recession may have permanently damaged the potential productive capacity of economies, thereby increasing the difficulty of distinguishing between the temporary (cyclical) component and trend (structural) component of GDP growth. More specifically, the greater the harm caused by cyclical developments to the trend, the more pro-cyclical the estimation of potential output will be. Conversely, it is also possible that the anomalous cyclical conditions experienced following 2007 have rendered ineffective the methods that normally functioned in the standard economic conditions of the past, taking account of the greater variation of the cycle around the trend that characterised the last recession. If this were the case, it would be necessary to identify a more stable and less pro-cyclical estimation of potential output. The Working Paper examines these issues for the Italian case. More specifically, it estimates an unobserved components model in which the output gap is represented by a cyclical component common to set of economic activity variables: GDP, unemployment rate and capacity. Specific trends identify the structural component of each of those variables. The model is completed by a Phillips curve in which inflation evolves as a function of the output gap, a trend component of consumer price developments and the oil price. Alternative forms – in the specification of the trend and in the information set ‑ of the estimation model produce a broad range of values for the output gap, confirming the considerable uncertainty characterising this variable. The uncertainty is essentially not eliminated by adopting a criterion for assessing the goodness of the various models. Purely statistical criteria (maximum likelihood or stability of parameters) lead to the selection of different models from those that would be chosen using a more economic criterion based on the goodness of their capacity to forecast inflation. However, any choice based on a given criterion may still not be stable over time. Models that appeared optimal prior to the recent economic crisis seem to have lost their explanatory power in recent years. In 2012-2016, the model with the best forecasting capacity is that with a less pro-cyclical trend and, therefore, a larger output gap. This superiority does not hold up, however, if forecasting ability over a longer time period is considered. This seems to represent a signal of the differences in the characteristics of the cycle in more recent years compared with the standard behaviour found in the past. 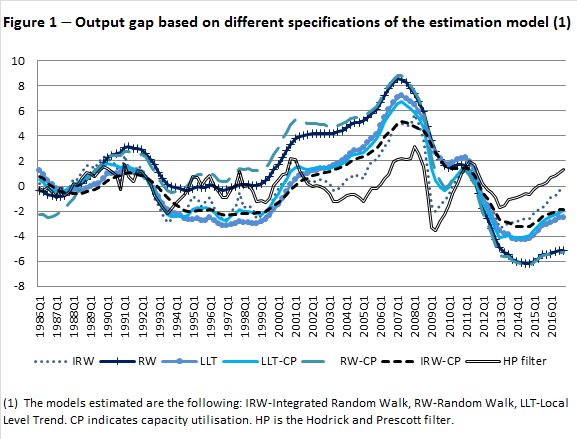 The evidence for the predictive capacity of the various models for inflation points to a deterioration in 2012-2016 in the signal provided by capacity utilisation. This appears to be yet another indication of the anomalous behaviour of the last economic cycle. What are the policy implications of these findings? An entity that permits economic policy decisions to depend on unobservable variables affected by considerable uncertainty cannot base its choices on a single estimation. It must have access to a variety of estimations, accompanied by confidence intervals, obtained using different methodological approaches or, alternatively – if a single model is desired – it should be sufficiently flexible to incorporate different assumptions about the nature of the cycle and the trend within its structure. The selection of one of the estimates from among the various alternatives, which as this Working Paper demonstrates may differ considerably, could be based, for example, on the central value of the interval, or may be determined (as in this paper) by combining statistical criteria with others linked to the specific features of the position in the cycle, especially in cases in which the length and depth of the negative phase of the cycle are highly uncertain. From this perspective, the plausibility tool adopted by the European Commission to assess the reliability of its estimations of the OG is a step in the right direction towards assessing the uncertainty associated with the estimates but cannot be considered sufficient given the scope of the problem. Using such a tool only determines whether the estimation of the OG falls within an acceptable bound, which is not a true confidence interval as it is based on an auxiliary regression model that still takes the trend (and OG) hypothesis of the Commission model as given. And it is precisely this variable, as this Paper also finds, that has been affected by the greatest uncertainty in recent years.